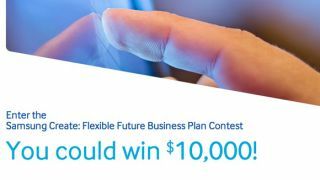 Got any $10K ideas floating around in your noggin? Hey, coming up with ideas is hard, especially with something as experimental "Youm" flexible displays, so why not crowdsource solutions? In the spirit of "sooo, you got anything?" Samsung launched a contest today to cull ideas and business plans related to its flexible display tech. The grand prize is $10,000 (about £6,400, AU$10,900), while a first and second prize are also up for grabs. Contestants will be judged on criteria such as the importance of the flexible display to the product, design, realistic hardware assumptions and business plan viability. Applications are due Oct. 6, but you might as well not bother - TechRadar's going to sweep the field with our plan for flexible, hi-tech slap bracelets. Need inspiration? TechRadar has plenty more blips to get your creative juices flowing.